Well hello there, Earthies. It’s been a while. Sorry for the prolonged absence but the holidays and other work took over for a bit. It’s good to be back! And back to reality it is. Sigh. As I’m sure many of you do, I find this first full week in January a challenge. After the indulgence and anticipation of December, it’s time to pare down, take stock, and forge ahead. When really I’d rather take a nap, curl up with a book, and continue eating and drinking like I did over the holidays. In the spirit of paring down, here’s a fresh and light winter slaw that can help get you back on track to healthy eating. It’s funny how slaw is such a summer thing. Hearty winter vegetables are actually better suited to this type of pickled dish. 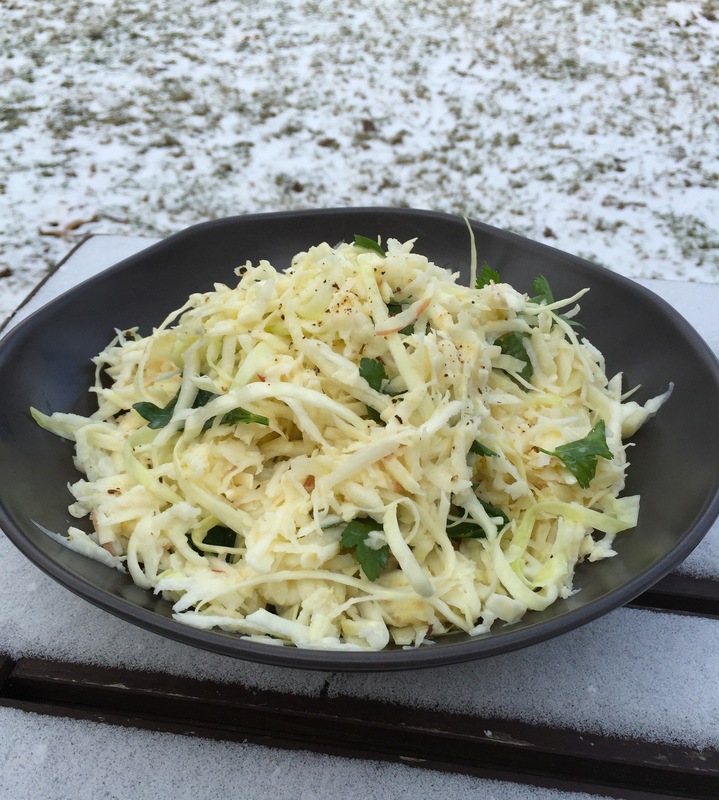 My favorite winter vegetable to serve in a slaw is celeriac, or celery root as it’s otherwise known. It may sound exotic but just about every supermarket I know will carry it. It sure looks ugly and knobby at the market but once you get it on the plate, it’s sublime. Its flavor profile is a combination of celery and parsley and it pairs nicely with the sweetness of apple and honey and the pungency of lemon juice and caraway. Last night I served this salad piled on top of crisp skin arctic char. But it would be just as nice sitting next to a seared pork chop or with silky poached chicken piled on top. First, make the dressing: In a screw-top jar, combine all the ingredients and shake well to combine. Pour the dressing into a large bowl. To assemble the slaw: Add the grated celeriac to the bowl with the dressing just as soon as you finish grating it and toss to coat so that the celeriac does not discolor. Do the same with the apple once you have finished grating it. Add the cabbage and caraway seeds, toss to coat all over. Cover the bowl and let sit for at least 30 minutes to soften the celeriac and cabbage and to infuse the flavors. Add the parsley to the slaw and toss again. Finish with black pepper and serve. *Once it’s peeled, celeriac discolors quite quickly. To be safe, I like to rub the bulb all over with a cut lemon just after I’ve peeled it. This entry was posted in salad, side and tagged apples, buttermilk dressing, cabbage, caraway, celeriac, celery root, slaw, winter salad. Bookmark the permalink.